The Virginia Fall is splendid when it comes to the mountains and the colors. Picture below taken at the pumpkin patch. I do like running in the cooler temps, pumpkin lattes, Halloween parties and seeing the leaves change. I don't, however, like the idea of the imminent winter. I'm really a spring person. I'm already dreaming of next year's garden, and I haven't even put this year's garden to bed yet (even though all I have left now is some lettuce). I have high hopes of some major garden extension next year. For month's I've been taking notes whenever I hear of some vegetable I want to grow next year. I have a great list of heirlooms I want to try. My parents are buying me some of these seeds for Christmas. I have a bit of a wait ahead, don't I? I cleared off the main garden yesterday and will plow today. The winter will bring lots of manure on the plowed ground. I still have some seeds to dry and put away. I don't like cold weather other than that bugs disappear and it isn't so hot cutting wood but then I wouldn't need to cut wood if it weren't for winter. We are going to make a batch of fall beer at the brewery next week, it will contain butternut squash, some 1850s corn and my heirloom hops with of course barley malt. We will put similar spice as what he has in the pumpkin beer which actually tastes good but I am thinking of grating some nutmeg to give a slightly different taste from pumpkin spice. Billy Hurt is playing at Chaos and the Festival this weekend. October is my favorite month and each year. Here's hoping this winter will be kinder to us than last. You are ahead of me, garden thoughts are more around January when it is cold.I love this season, I was out all day yesterday and plan on trout fishing today.Going riding tomorrow with a small group. Yes, if only! I'm very comfortable with our long lasting autumn and just the thought of blustering winds and heavy snow ready to break the silence is well, not something I'm ready to see yet! dat ziet er heel mooi uit en ik ben benieuwd hoe groot de oost volgend seizoen gaat worden. Oh yes, spring ~ love it! I look forward to fall and yes winter. After our long hot summers I am so ready for the cold weather! Oh I can get annoyed with it at times if we have a super bad winter, LOL but over all I like it! Maybe try winter gardening in one row and see how it does! Have you seen the Mother of a Hubbard blog? She has great info on winter gardening. She is zone 6. What she grows in the winter is amazing!Everything I am setting up here for winter growing I got off her blog and out of the two books she suggested that of course I had to get and read! Yes it is a bit of a wait but as you know Spring will be here before you know it. Sounds exciting about the seeds. Looking forward to your harvest next year! That's a bumper crop! We had NO luck with our pumpkins this year. No idea why... Your view is gorgeous. I'd like spring over fall to! I like the taste of pumpkin, but had a skin reaction from one recently. I'll have to substitute it for sweet potato. We have been procrastinating here! That's a pretty picture of a pumpkin patch. I dread winter and am with you on boycotting it. I would like winter if it ended in January! I like this time of year. I def. won't miss winter this year. Not really too early. I don't think it is ever too early to plan the garden. And as for the wait....the garden needs to rest a bit before starting again, so I think you are right on track. It's fun to spend the winter dreaming of the garden of next year. I hear you Lisa - Winter is a drag. I am with you.... NO WINTER this year. Tired of the cold temps already. That photo is so pretty and festive. Happy Halloween! 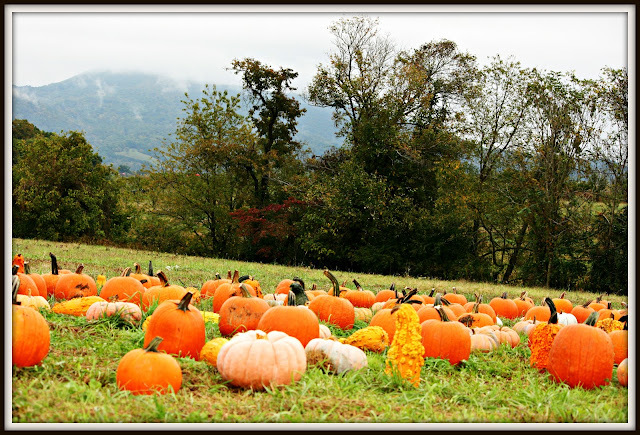 Awww...lots of pumpkins there, how lovely! What a shame, Lots of my young little pumpkins are fallen this season, I don't know why. I'm not a winter person either. I don't mind fall, but it's a sign that things are about to die. You sure have quite a wait for those heirlooms! Lovely photo! Yes, let's boycott winter together! I've already been daydreaming of the warmer temperatures here too. I've also been enjoying this very beautiful fall. It's been really picturesque this year! Perhaps the winter will come and go before you know it??? Love the fact that you've already planned your spring garden. Woot Woot!